Wash the large bell peppers. Cut a circle around the tops, throw away the inside and the seeds, wash out well. Cut the bottoms slightly in order for the bell peppers to stand up properly. Drain the peppers upside down on paper towels. Set aside. Preheat the oven to 350 degrees. Chop 1/2 of red bell pepper and 1/2 onion. Use large fry pan. Place olive oil in fry pan. 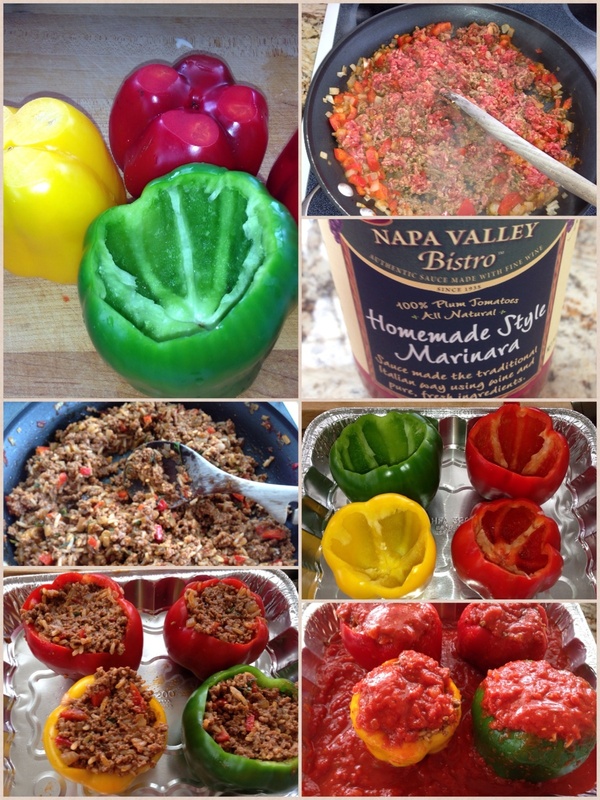 Over medium-high heat, sauté chopped onions and red bell pepper until translucent, approx. 5 minutes. Add ground meat and brown the meat evenly. Add 2 T of sofrito and mix. Add 1 can tomato sauce, cook on medium for about 20 minutes, until liquid is absorbed. Add golden raisins, parsley, and cooked white rice. Mix well and sauté 5 minutes more. Add salt and fresh ground pepper to taste. Set aside. 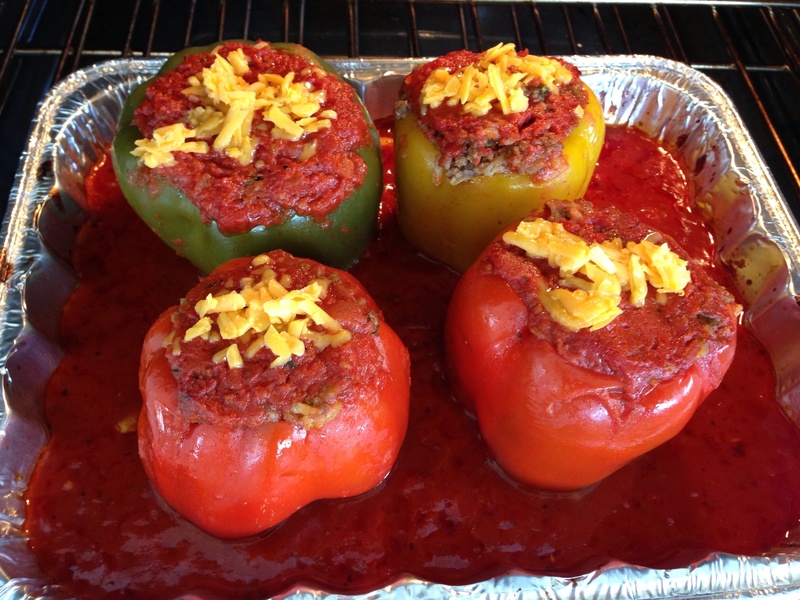 Place the 4 bell peppers in a large baking dish, stuff each pepper with the hamburger mixture, packing it down. Pour the jar of marinara sauce on top and around the peppers. Cover with foil and baked for 1 hr. and 15 minutes. Uncover the peppers and top with shredded cheddar, leave uncovered in oven for 5 minutes more until cheese melts. Serve with white rice and peas on the side. Pour marinara over top of pepper and rice as desired. Serves 4, can be made ahead and reheated. This entry was posted in ENTREES and tagged dinner, entrees, green peppers, ITALIAN, marinara sauce, PEPPERS, red bell peppers, stuff bell peppers, stuffed peppers, sweet and sassy, sweet peppers. Bookmark the permalink. Thanks Ginny, I appreciate your comments. Love the presentation! 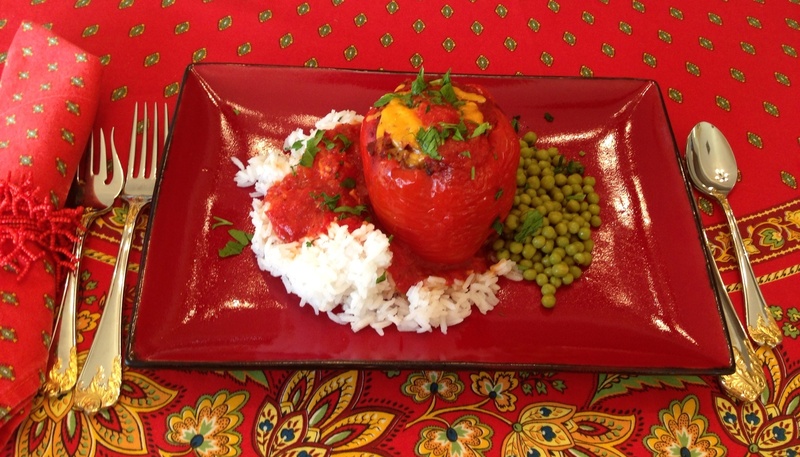 I make peppers often but like the different twist of your recipe..need to give it a try! Thanks Mercy, I made it from experience, no written recipe, the raisins, were a sweet twist! Hope you like it! !